We at Cherrywood Foot Care are proud to offer our patients diagnostic ultrasound so we can investigate and visualize soft tissue diseases of the foot and ankle. This innovative technology helps us gain a more concise diagnosis and tailor a more efficient personalized treatment. Diagnostic ultrasound, also known as musculoskeletal ultrasound, is a non-invasive test used to evaluate the tendons, ligaments, nerves, muscles and other soft tissues of the foot and ankle. It is similar to sonar used on submarines by the military and fetal ultrasound used by OB-GYN doctors to evaluate a developing baby in utero. Ultrasound diagnosis is performed with high-frequency sound waves that are higher than the range of human hearing. We can visualize soft tissue structures when the ultrasound beam is transmitted into the foot and its echoes are reflected from these structures and displayed on a small television monitor. In experienced hands, like ours at Cherrywood Foot Care, the images and information obtained from the ultrasound can provide as much information as much more expensive and time-consuming tests such as MRI and CT-Scans. Diagnostic ultrasound is quick and painless, and it’s covered by most insurance plans. The entire process can usually be completed during your regular office visit at Cherrywood Foot Care. It involves simply placing some gel over the areas to be inspected. Then a small probe is employed to explore the tissues. Since the ultrasound waves are harmless (otherwise they would not be used on developing babies), this test is painless. What is diagnostic ultrasound used for? We use this test to evaluate and document problems such as tendonitis, heel pain, pinched nerves and neuromas, puncture wounds caused by stepping on glass or wood, deep infections in the foot and ankle regions, and stress fractures. 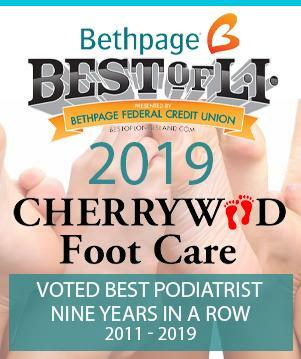 With the addition of diagnostic ultrasound, Cherrywood Foot Care continues its reputation as a leader in the diagnosis and treatment of foot and ankle diseases and pathology. If you are suffering from chronic foot pain associated with soft tissue injury or disease, diagnostic ultrasound could help to obtain an accurate diagnosis of your foot or ankle problem. Contact Cherrywood Foot Care today to schedule a consultation to see if podiatric diagnostic ultrasound can help in the treatment of your foot problem.